While growing up in the United States, my friends and I never seemed to tire of asking each other, “Who is the Lincoln Memorial named after?” and “Who is buried in Grant’s Tomb?” The point of asking these silly questions seemed to be their obvious answers. When you grow up, however, you learn that the truth is not always so clear. Take, for example, Jerusalem’s Tower of David, also called David’s Citadel. King David, for whom it is apparently named, had nothing to do with the tower or any other part of this historic structure. The tower is actually part of a medieval fortress that contains architectural additions from later periods. It is located near Jerusalem’s Jaffa Gate, which is the most trafficked entrance to the Old City. The tower is so well-recognized, it appears emblematically in countless Jerusalem paintings and photographs. Early Byzantine Church fathers misinterpreted Josephus Flavius’ writings, ascribing the Tower of Phasael, from King Herod’s time, to King David. To further complicate the issue, Muslims also associated the Herodian tower with King David. They named their mihrab (prayer niche) Nabi Daud, David the Prophet. Later still, 19th-century Western Christians labeled the Turkish minaret added to the Mamluk mosque the Tower of David. This wrong name is what the tower is still called. 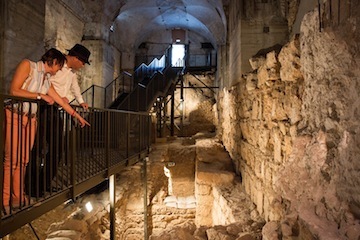 Tower of David Museum’s mission, in contrast, has evolved over time and various administrations. When the museum first opened in 1989, the aim was to present Jerusalem in all the years of its existence. Today, that is still a large part of the museum’s objective, but staff now creatively focus on familiarizing the public with the building complex’s amazing and lengthy physical presence. No easy job in an historic structure bound by preservation guidelines, in a city that has supreme importance to several of the world’s major religions and dates back to the second millennium BCE. One of the new must-see additions is the Kishle. The discovery of the Kishle – when the Turkish Ottomans built a prison there in the mid-1800s, the Kishle referred to soldiers’ barracks – was accidental, but the follow-up to this archeological find has been careful and meticulous. What has recently been opened to the public is a continuous cut-away, or time line, of Jerusalem. The excavations reveal Jerusalem from as early as the sixth century BCE. It likewise shows walls from the time of King Herod – some of Herod’s huge building stones from the last quarter of the first century BCE are also still in place to the right of the museum’s main entrance by Omar Ibn El-Khattab Square – as well as evidence from the Middle Ages. Of particular importance is the discovery of a wall from the First Temple period, which adds to our knowledge about the city wall’s ancient route. Walking outdoors to the Kishle exhibit is an adventure in and of itself, as visitors traverse a dry moat that surrounds the Citadel. Also outdoors are finds going all the way back to the Second Temple period. The museum makes an effort to present Jerusalem from a variety of angles. Take, for example, the current temporary exhibit, Camera Man. In this wonderful photo display, we are able to see Jerusalem over 50 critical years of existence, a time in which its rulers switched hands three times, from Turkish rule to British rule to state of Israel rule. But the beauty of this show is that it zeroes in not on the wheeler-dealers of these various administrations, but rather on the daily life of the average Jerusalemite. Relatedly, the museum seeks ongoing public involvement. Hence, it has taken two rather bold steps: it has taken part of the Camera Man exhibit out of the museum complex, mounting some of the photos in the centre of town, in close proximity to busy Machane Yehuda Market. A second significant step – that dynamically changes the exhibit, even as it is being shown – relates to the museum’s invitation to Jerusalem residents to send photos from their own family albums. Thus, with this participation, the exhibit is frequently being updated. But the museum has not limited itself to just presenting Jerusalem’s history through photography. In the past year, it has gone digital in a big way. Families with elementary school-age children may now pay a small additional fee to tour the museum with enhanced iPad technology. In the Hebrew version of the award-winning Swipe the Citadel – an English version is in the pipeline – the family joins in the search for an archeologist’s young missing daughter. The virtual family and the real visiting family travel through the museum’s many old stone corridors looking for the girl. At the end of the adventure, virtual father and child are reunited, and visitors have been exposed to Jerusalem’s long and amazing history. There are currently six other apps for improving the on-the-grounds museum experience, including a digital detective game to discover who built the tower. A preview of what is available can be seen at tod.org.il/en/todigital. The museum is always thinking of new ways to reach families. With this in mind, it has started hosting a new outreach program that allows families with children with special needs to participate as a family unit. The whole family attends and each member of the family engages to the extent to which he or she can. The museum already has a quiet room and a time-out room, and has been consulting with specialists to further develop meaningful family experiences. While the Night Spectacular is an established program for Jerusalem tourists, readers might not know that there have been incredible outdoor evening concerts in the museum complex. 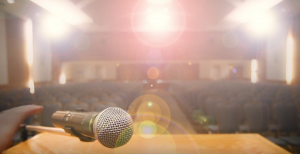 These concerts have varied, from large events of hundreds of people listening to classical music, to smaller events of international liturgical music. In the past, Tower of David Museum has hosted some incredible events for Jerusalem’s ethnically diverse population. For example, in 2000, Washington state artist and craftsman Dale Chihuly put this question to the people of Israel: “What’s incredibly hard to make, but all too easy to break?” Through his installation at the museum, Chihuly showed there is more than one way to solve this riddle, but his simple, yet thoughtful, answer was: “glass and peace.” The artist has donated some of his work to the museum. While there may be a question about the museum’s name, there is no question you have to check it out the next time you are in Jerusalem.